It has been a very, very long quarter. In the fall, I received some unexpected projects at work. I implemented a conference, spent half a week touring potential conference venues, and helped get the next event’s plan in place. I was sick more than I expected to be, and frustrated when illness wiped out days I needed for tasks. I signed on for first-round Cybils judging, expecting that about 100 books would be nominated in the YA fantasy/science fiction category--and more than 150 ended up on my two-and-a-little-bit-of-month reading list (147 is the final eligible number). I expected I could review 100 (my final count, at the end of the year, will be 118 read--nowhere near the picture book folks’ numbers, but more than 40,000 pages...and the 29 books I didn’t receive a copy of/couldn’t borrow/didn’t choose with my personal book budget and thus didn’t see for myself are going to haunt me forever). And some other things came up, things more personal. What I can say is this: I have, after many years of testing the boundary, found my personal limit of time divided by tasks. Some less-than-urgent things fell by the wayside, and I’ll be making those up in the new year, even while picking up others (teaching my second year of event planning boot camp, for example, and I’m going to get back on a running program, even if it’s a tiny one). I lost my temper more often, and I curled up with a cup of cocoa and blanket more often. But there are some fantastic things that happened this autumn. I read some truly fantastic books I wouldn’t have been able to justify squeezing in without the Cybils--and I’ll review another 10-15 of my reads in the winter and spring; I hope that I’ll be able to give a little more thought to those reviews, too. My balance definitely has been off for a while! I’ll give away as many of the books I won’t be able to review so that they can have a second publicity life. To all of the publishers and authors who provided review copies: thank you, thank you, thank you. If had a little better idea of what I was getting into, I’d have done some more showcasing and shout-outs. Since I didn’t, please know that every book I got my hands on was treated with thought care, even if--as noted under the rules--I wasn’t able to finish it and review it. I’ve also got the bones of a post together on what made particular titles pop for me (remember, the Cybils were judged by a committee, and while I won’t spill any exciting details or hints about the process, I will assure you that it’s not a hive mind situation), as well as some problems I saw in books. Maybe it will help some aspiring and established authors, maybe it won’t. In the end, I’m just one reader in a sea of book lovers. 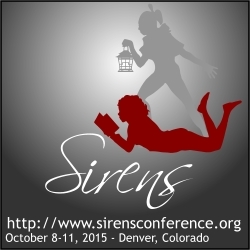 In the new year, I’m looking forward to turning some of my focus back to the Sirens conference reading list to get a better handle on the theme, and maybe putting together a presentation. I’m hoping to travel to ALA in New Orleans (if I can’t make BEA, the ALA exhibit hall is the next best place to research for my particular volunteer work) and to the west coast, and maybe take my first overseas trip. Until the end of the year, I’ll be headed right into the flood zone in the great Pacific Northwest, so--well, by the time this posts, I might even be out of range. And thus, to you and yours, my very best wishes for a happy, healthy new year, full of the very best stories. Isabel is alone in the Mistwood when she's called: it is time for the Shifter to resume human form and protect the king, as she has for generations. When she wakes in the castle, she's missing some memories, and her instincts aren't working quite right--and neither is her ability to shift into various forms. In Mistwood by Leah Cypess (HarperCollins - Greenwillow), Isabel is back on protection duty after her first known failure to protect a king. Loyalty is given to the crown, so now, she's been called to protect the usurper's son. With some of her memories difficult to access, Isabel finds the political climate of the court tricky to navigate, and the court finds Isabel just as tricky, because she's showing some human thoughts and emotions that the Shifter shouldn't bother with. Isabel is tested when the failed king's son returns and challenges the usurper's son. It's not only her magical fighting skills under the gun (sword? ), but her ability to tease out half-forgotten truths to determine who's worth dying for. Mistwood has an interesting structure. The first two-thirds are very much character-driven, while the last third more action-based with a strong mystery feeling. Isabel and Clarisse, the sister of the usurper's son, are the most interesting characters--Clarisse especially so, because her loyalties and motivations are murky at best. Before I Fall by Lauren Oliver (HarperCollins) reminded me a lot of The Deathday Letter: both books on mortality and what you're going to do with it. It seems like everything's going right for Sam. She's unquestionably popular, has the right boyfriend (one who refused her years ago, no less), has three BFFs, and tonight is going to be THE big night with her boyfriend. The problem is, her day isn't starting off so well--she's awake too late to get a shower, she gets a rose from the wrong boy, there's a fight at this party when a weird girl shows up, and then Sam dies. And wakes up, and finds herself in the same place she was twenty-four hours ago, faced with tackling the same sometimes-awful, sometimes-wonderful day. After several attempts to make things right, Sam figures out that it's maybe not so much about dying as about living every moment you have. For all that Before I Fall is about death, the strongest focus is on puzzling out the events of the day; at the same time, the message is clear: you never know when it will be your last time. It took me a long time to connect with the protagonist, but upon reflection, I like that she's not always likeable; it seems like that's okay for a boy protagonist, but not for a girl, so I'm glad to have seen her. The last quarter of the book is the strongest, as Sam unravels problems for and about those she loves best. o Toads and Diamonds by Heather Tomlinson (Henry Holt) takes an old French fairy tale (see also this annotated version) and transports it to a fantasy pre-colonial India, drawing on the traditions there in a way similar to how a lot of fantasy draws on "ye olde medieval England" to ground a tale, and creating a sort of fusion retelling. In online interviews, the author explains that she was seeking a reptile-friendly setting, and in notes for the book, she gives a brief overview of how she drew on the historical period and religions, as well as suggestions for further reading. I note this to explain that this reminds me of, say, Silver Phoenix--not everything in the book will map to a present or past thing (attitude, food, location), but Toads and Diamonds undeniably evokes its Indian inspiration. Tana and Diribani, half-sisters, have fallen on hard times; their father, a jewel merchant, has died, and their (step-)mother hasn't been of much support. They've sold nearly all of their belongings. But, when Diribani goes to fetch water, she meets Nagali-ji*, one of the twelve gods of Diribani's religion, and Nagali-ji gives her the blessing (or burden?) of speaking flowers and jewels--which prettily demonstrates some of Diribani's unspoken thoughts as well. The girls' mother encourages Tana to visit the well too, but Tana's gift is to speak (lucky) toads and snakes--some poisonous, some very, very useful. From there, the sisters' stories diverge for some while. Diribani attracts royal attention, and must figure out how she can use her gift and how she can resolve her feelings about the prince, who observes a religion that's in power and very different from her own. Tana is in more immediate danger in her home city, and must go on the run, but her travels endanger the man she loves. Both of them will need their gifts to stay alive and to find a way back to one another. I especially appreciated how the separate stories came full circle, and how subtle some of the conflict was. Even with the adventure aspect, Toads and Diamonds is a quiet read, yet a quick one. It's always nice to see fantasy set in non-Western settings, especially in the YA market. *I'm away from my copy right now, so I apologize for any misspellings. Sadly, a bout with the flu has me behind on having reviews ready--I've caught up to myself at last. In the meantime, check out this post if you're interested in contributing fantasy reviews appropriate for this project. Questions? Just ask. Picture the Dead by Adele Griffin and illustrated by Lisa Brown (Sourcebooks - Fire) didn't grab me right away; I think the cover misdirected me a little, though on reflection, the font, at least, is evocative of the insides. Jennie, of Brookline, Massachusetts, has lost her twin, Toby, and her half-cousin (and fiancé) Will to the Civil War. Only Will's taciturn brother Quinn has come home, and her help nursing Quinn's injury isn't quite enough to keep Jennie safe from being turned out by heartless Aunt Clara and Uncle Henry. She's reduced to servitude in her foster home, to things like running errands for Uncle Henry, who wants to consult a medium about Quinn's death, but who can't be debased to set up an appointment for something like that. Then things start to go grimmer--phantom necklaces that tighten in Jennie's sleep, a ghostly undertow, the claustrophobia of attic rooms. Most everyone Jennie loves is dead; is she next? Picture the Dead hits a bunch of the tropes that you'd expect to see in a story with ghosts, a medium, and a brooding, gloomy household, but the results aren't ghastly at all--rather, deliciously shivery. Readers who liked A Drowned Maiden's Hair a few years ago might like this one now. Living Hell by Catherine Jinks (Houghton Mifflin Harcourt) is one of the scariest books I've read this year. I could not look away--just like I could never look away from, say, Alien(s). Cheney's life on the Plexus is pretty unremarkable. He's awake, and in suspension for four years, and awake again as the colony roams the universe for a habitable planet. He does rotations around the ship, learning different jobs, wondering if they'll ever find a safe place to call home. And then, one day, the unthinkable happens: a red alert is called because there's a wave of strange radiation ahead. At first, everything seems to be okay, but then the careful balance of the ship goes...out of whack. Strange things are growing on the walls. Things are getting sticky. And people are dying. Cheney's friends an family are some of the smartest humans ever, but can they figure out what's going on in time to save themselves? The Deathday Letter by Shaun David Hutchinson (Simon & Schuster - Simon Pulse) starts when Ollie receives his final notice: he's got 24 hours to live. So, what does a 15-year-old do when he's thinking about mortality? Sort of the same things that kids who think they're immortal do: go driving without a license, try drugs and alcohol, try to get laid, jump off a bridge (because everybody's doing it). That's what Ollie does, and his best friend, Shaun, and his other best friend, Veronica, tag along. Ollie manages to be sympathetic despite reminding me pretty much of a high school boyfriend at a time when, like a lot of teenagers, brains and mouths were unfiltered. He's kind of a tool, but as the best tools do, he experiences some growth in those hours that remain to him. Despite the speculative scenario, I think this story is best matched with readers who like whimsical realism, and will resonate with fans of stuff like Ferris Bueller's Day Off. I'd hand it to readers who liked Nick and Nora's Infinite Playlist, Swim the Fly, Going Bovine, and (I hear, though it's still on my to-read list) Before I Fall. I gulped down The Clearing by Heather Davis (Houghton Mifflin Harcourt - Graphia) in one sitting on an airplane. It helps, I suppose, that it's set in western Washington, an area I'm very familiar with; it helps, too, that a minor theme is getting away from a bad relationship, which is a nice change from all of the magical, destined, no-way-out romances that are popular...but a little creepy as a steady diet. Amy has moved to the North Cascades to live with her Aunt Mae--and to get away from an abusive boyfriend. She's starting over in a small town that's nothing like Seattle, and battling preconceptions about city girls. Making friends when you're the newbie in town isn't easy, so when Amy goes exploring in the mist on Aunt Mae's property and meets Henry, who seems to want nothing from her, she finds herself spending a lot of time with the boy next door. Henry's concept of time is different, too; he's been living the same day over and over, a wish he made to prevent that tragedies related to his brother's military service. He mows the same patch of grass on the farm every day, while his mother and granddad go about the same routine--only once Amy shows up, they start to suspect that something's not right. If Amy can help Henry find his future, what does that mean for Henry? For their romance? What happens when you're really out of time? Pod by Stephen Wallenfels (Namelos) starts in Prosser, Washington, with the wake-up call of an incredible noise: strange alien spacepods hovering over everything, zapping anyone who dares go outside. The book alternates between Josh, a boy who's stuck in his house with his dad, and Megs, a girl who's stranded in the parking garage of a hotel. Josh and his dad spend a lot of time cooped up contemplating survival, mortality, and the end of their days, while Megs spends most of her time trying to avoid being noticed by the authoritarian society that's sprung up inside of the hotel--and that would like to see her dead. I was favorably reminded of Life as We Knew It by Susan Beth Pfeffer for Josh's half of the tale, while Megs had more of an adventure/survival story that reminded me favorably of Home Alone, of all comparisons (certainly less humorous, but Megs shows no less ingenuity). Pod is a gripping read that is open for a sequel--but I felt that that the story wrapped up nicely, even with open threads. I really enjoyed reading The Rise of Renegade X by Chelsea M. Campbell (Egmont). Damien Locke is excited to get his V--a fingerprint on his thumb that will identify him as one of the supervillians of Golden City. (Icky boring superheroes get an H instead.) Damien gets a surprising X on his finger, and his mad scientist mom admits to a single...encounter...with a superhero in a subway bathroom that led to his birth, and so he's got genes from both heroes and villains. When Damien tracks down his superhero dad, dad wants Damien to come stay at dad's house, try out a different lifestyle, learn to fly (despite Damien's disdain for heights), maybe skip going off to villain academy. Damien hates it, but he might be more soft-hearted than he knew. His future is a puzzle, and he's going to have to solve for that x. Even though Damien is a toad, and his antics frequently cringeworthy, it's hard not to root for him as he spins the needle on his moral compass. He's a very different kind of protagonist, and the humor and nods to superhero comic book tropes are a nice touch. Well, this isn't even in the U.S.'s Amazon system yet; it's an Australian book published by Lothian, a Hachette imprint. So, hmph, no cover image. For now. Amazon, I'm giving you the stinkeye. Chasers by James Phelan (Hachette - Lothian) is yet another post-apocalyptic zombie tale. Jesse is on the subway with other Model UN kids--Dave, Anna, and Mini--when an explosion rocks New York City. They survive and emerge to a strange world where the people who can still move have an unquenchable thirst, even drinking humans. The kids find their way to 30 Rock and set up a haven on the observation levels, trying to figure out how they’re going to get out of a city that keeps collapsing, off an island with no bridges. For Jesse, things start to blur--what happened when he raided apartment 59C? Why can’t he remember yesterday? Why can’t they decide whether to stay or to go? As the start of a series, Chasers has a lot of potential and a neat twist at the end of this first book. In addition, it's interesting to see the U.S. through an international lens as the four--from the U.S., Australia, the U.K., and Taiwan--try to figure out how they'll survive. I have no idea if this has a U.S. release date, sadly.